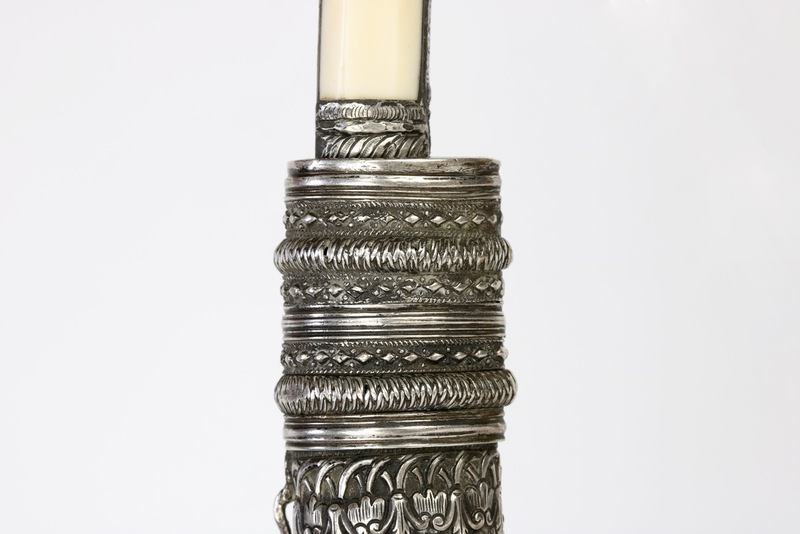 Materials: Iron, steel, silver, bone, wood. 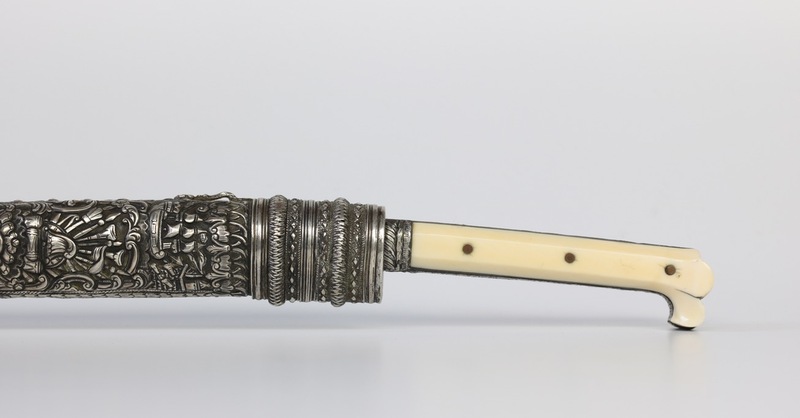 An Ottoman bichaq , literally "knife", shaped like a miniature yatağan , the sword carried by military men (infrantry) and wealthy civilians in the Ottoman empire. 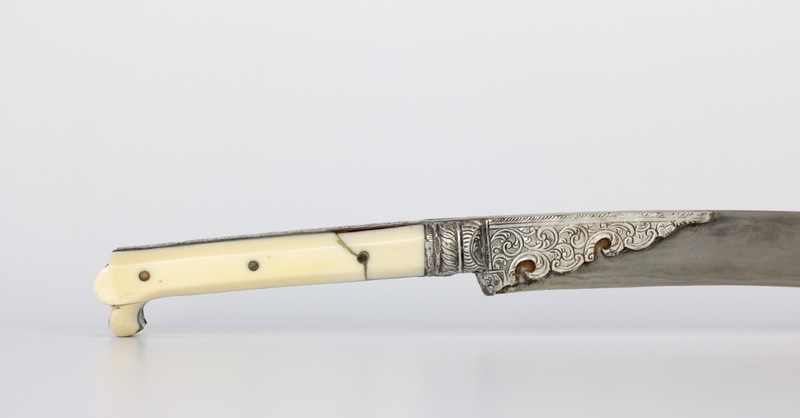 The forward curving blade is of forge folded construction with layers of hard steel making the edge and milder steel for support. It bears a small mark on the left side, probably a maker's mark. 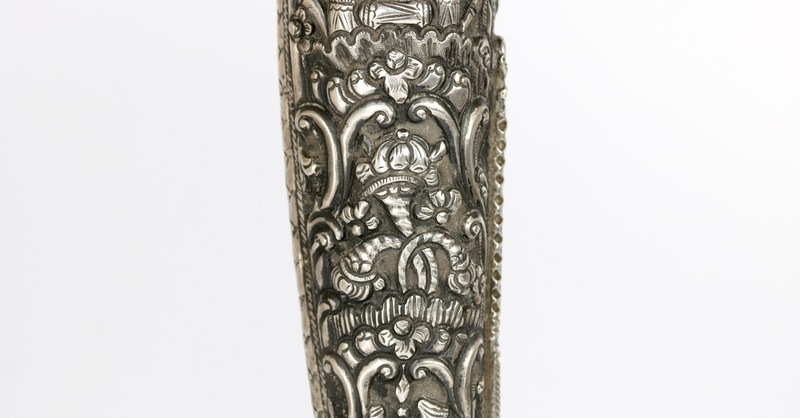 There is a silver ornamented sleeve at the base of the blade. 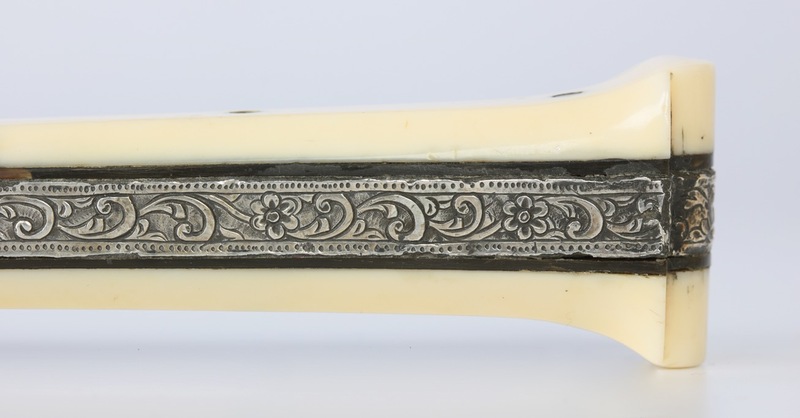 The handle with typical eared shape is made of dense bone plates, each riveted to the tang. 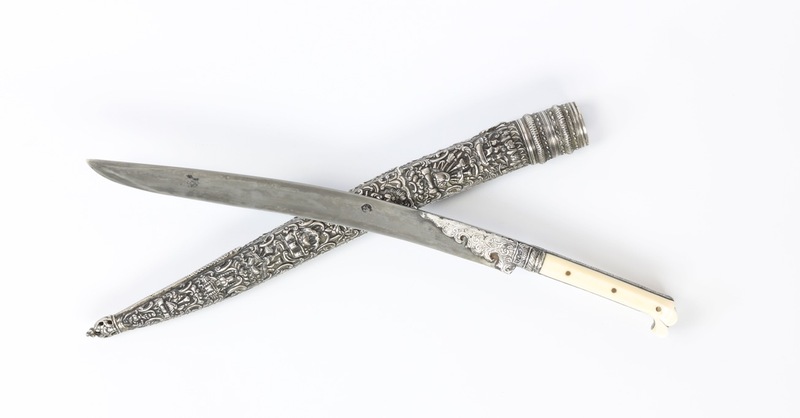 The tang is covered with silver sheets, engraved with floral decor. There is a repair at one of the ears, and damage at the top of the base of the handle. 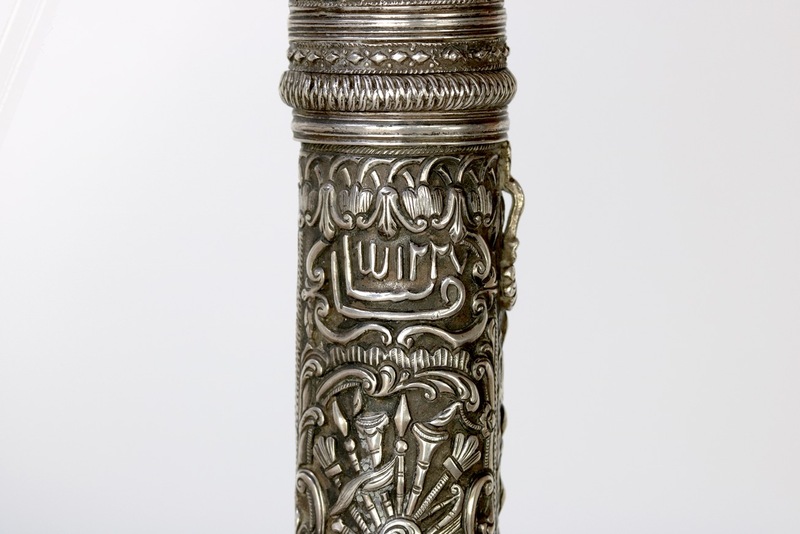 It comes in a wooden scabbard, entirely covered in silver plating that is decorated in repoussé in high relief. 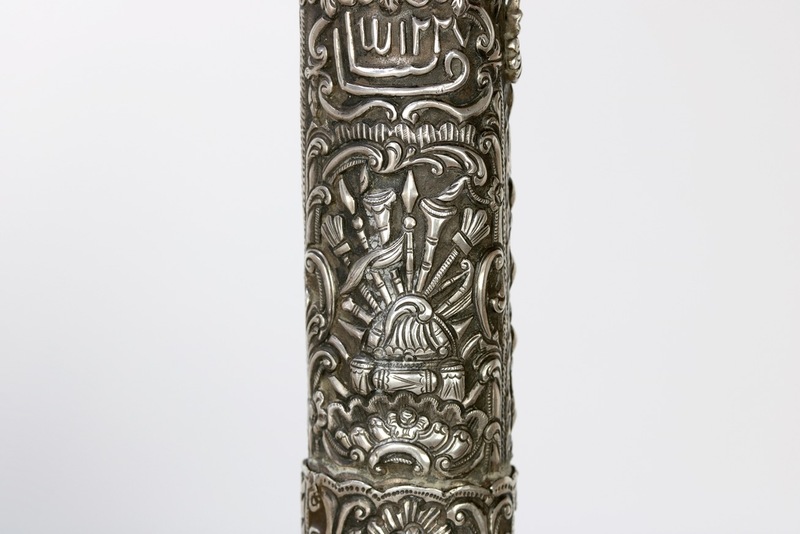 The scabbard is signed with the Islamic date 1227, corresponding to late 1811 through most of 1812 in the Gregorian calendar. 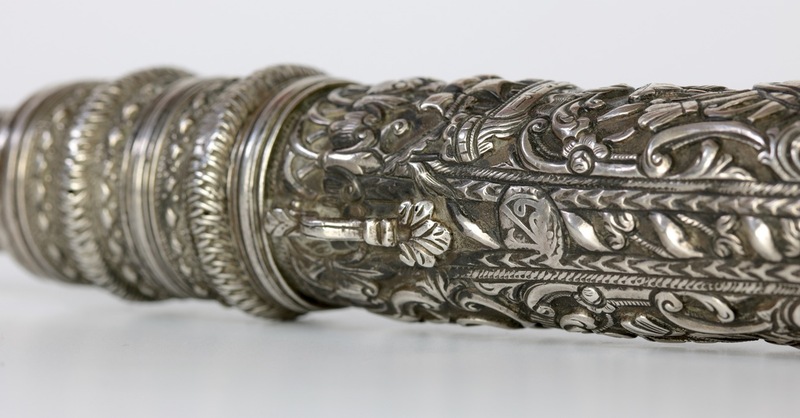 The scabbard ornamentation is full of interesting little scenes that are different on both sides. The top right side shows a ship that appears to be battling a fortress. There are also several patches that remind of musical instruments for a marching band, a mosque or similar building, and European looking coats of arms. 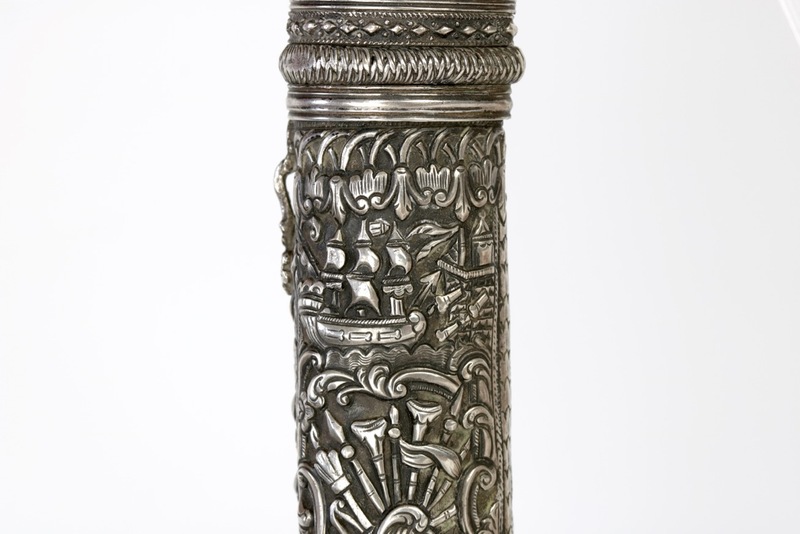 The scabbard further has three small stamps that appear to be Ottoman silver marks. On the back is a small loop for a cord or tassel. 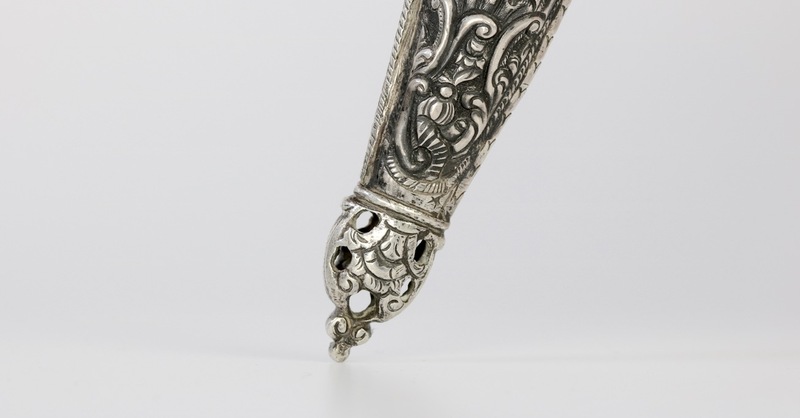 At the very tip is an elegant hollow finial with openwork. 1. The official Ottoman Coat of Arms has an interesting history. In 1856 after the conclusion of the Crimean Wars the Queen of England, Victoria, gave the Ottoman Sultan the Garter Order. Anyone who received this order would have his or her coat of arms hung in the St. George Church in Windsor Palace, London. The Ottoman Sultan had no coat of arms, so Queen Victoria ordered a specialist to Istanbul to create -together with the Sultan- a coat of arms for the Ottoman Empire. Sultan Abdulhamid the Second was very much into showing off the Ottoman Empire to Europe, and under his rule the use of European design elements piqued. It was him who added weapons to the coat of arms in typical European heraldic fashion, and in 17th of April 1882 it got its final form. See Professor Dr. Selman Can's article at the at the Mavi Boncuk blog.